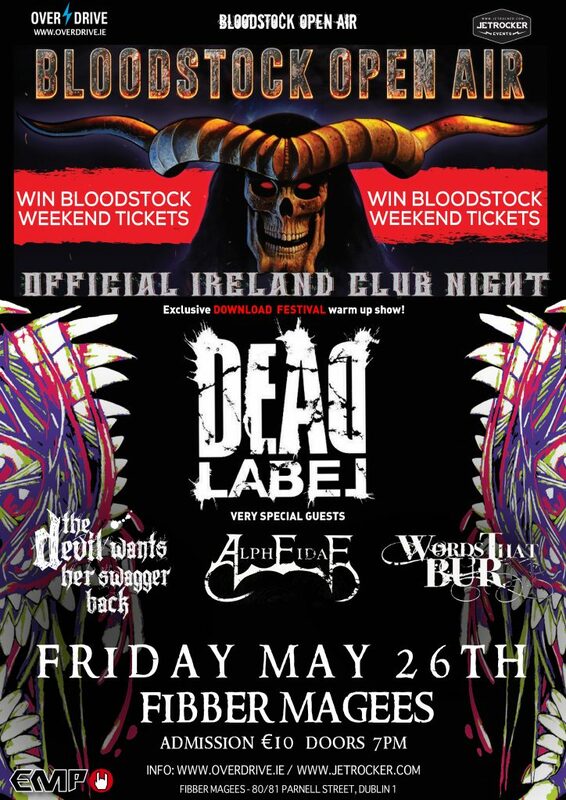 WIN WEEKEND CAMPING TICKETS FOR BLOODSTOCK 2017 – OFFICIAL IRELAND BLOODSTOCK CLUB NIGHT! With each passing week pushing us that little bit closer to this year’s BLOODSTOCK FESTIVAL, Overdrive / Jetrocker Events in conjunction with Bloodstock and EMP have put together one hell of a shindig to celebrate all things metal! Oh, we should probably mention that we will be giving away two-weekend Bloodstock camping tickets!!!! Details below. Who wants to go to this year’s Bloodstock Festival? 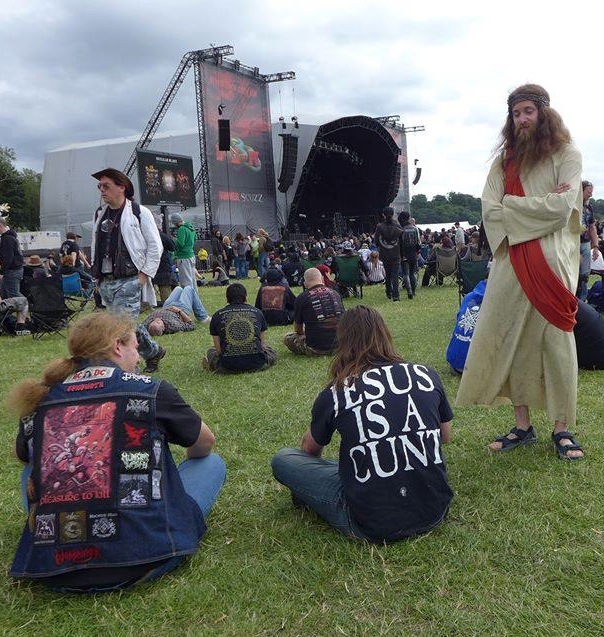 Well, if you’re anyway into metal then consider Catton Hall, Derbyshire ground zero between August 10th and 13th where some of the world’s most highly regarded artists will be gathering to lay waste to 15,000 punters. 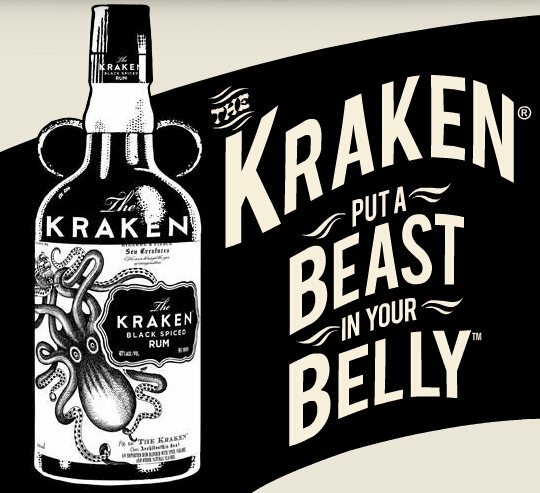 Win Bloodstock weekend tickets or Kraken Rum only at Fibber Magees on May 26th! 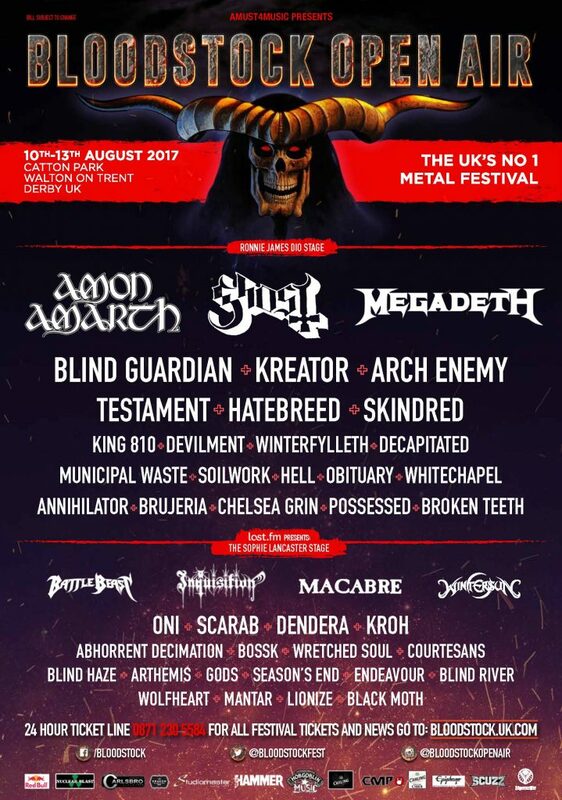 Headliners, Amon Amarth, Ghost and Megadeth will be joined by the likes of Blind Guardian, Municipal Waste, Kreator, Arch Enemy, Testament, Hatebreed, Skindred, Municipal Waste, Hell and much more! Overdrive in conjunction with Bloodstock Open Air, Jetrocker, EMP and AC Promotions present IRELAND OFFICIAL BLOODSTOCK CLUB NIGHT in Fibber Magees on May 26th with a very special debut headline performance from Dead Label, before they take to the stage at this year’s Download Festival on Saturday, June 10th. Admission €10.00, doors from 7pm. Dead Label are gearing up for a busy Summer with dates across Europe alongside Nervosa as well as multiple festival appearances including the UK’s Download Festival on June 10th. Having already been booked for 2018’s Hammerfest, the Celbridge three-piece are firing on all cylinders since the release of their highly acclaimed ‘Pure Chaos‘ release in March. The video which was directed by Crooked Gentlemen has reached over 40 thousand views since and can be seen regularly on Scuzz TV. Watch the uncensored video below. Please note NSFW ending. 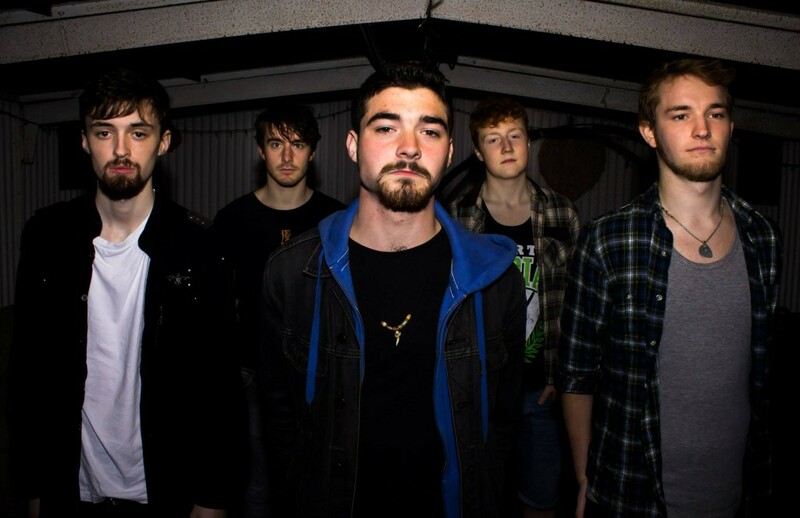 Speaking to drummer Claire Percival recently, Overdrive can reveal that Dead Label will be playing a selection of brand new material when they take to the stage in Fibber Magees on Friday, May 26th for their first official headline slot on home soil! She commented, “We’ve been working on loads of new material and as a special treat, we are going to be playing some of the new stuff in Fibber Magees as a very special warm up show before we head off on tour“. She continued, “We have some really cool limited merchandise also for the show which I’m hoping people will like. It’s a huge honour for us to be playing this show in Fibbers especially with such a fantastic line-up of amazing Irish metal bands“. Joining Dead Label are joined by the mighty ALPHEIDAE who will be performing their very last show with long-term members Leon Bourke (guitars) and Ros Coghlan (guitars) who are moving to Canada later this year. The Dublin-based metal band have been a staple of Ireland’s growing contemporary metal scene, bringing a unique and weighty offering of vicious live experience, loaded with enough power to generate a small electrical storm. Although the future of the band is unknown at this point in time, this is the band’s only scheduled performance for the foreseeable future, so don’t miss it as they are guaranteed to be a highlight in the lineup. For more information on Alpheidae, please click here. Speaking of the blistering line up on offer for this event, Overdrive and Jetrocker have brought in the face-melting antics of The Devil Wants Her Swagger Back, who have been the most talked about band within the Irish metal scene over the last few months. Having just returned from a nine-date Russian tour before smashing their way straight into the finals of this year’s Irish Metal 2 The Masses Bloodstock showcase, TDWHSB are on top of their game right now and should not be missed! The bands ‘Malice‘ release saw them expand their sound to a whole new level and with the addition of the fifth member, guitarist Damien Regan and work already underway for a follow-up EP, it seems nothing can prevent this Dublin-based upstarts from essentially melting your face clean off when witnessed live. Find out more on The Devil Wants Her Swagger Back here. With the news that Words That Burn have been confirmed for this year’s Exit Festival in Serbia alongside Destruction, The Black Dahlia Murder, to name but a few, the Dundalk-based alternative, the melodic metal crew have been busy preparing for a Summer of European dates and headline shows. For more information on Words That Burn, please check out this link. As it’s an official Irish Bloodstock Club night, we can’t just leave it at that? No Sir! There is also a chance to WIN FULL WEEKEND BLOODSTOCK CAMPING TICKETS on the night or a bottle of Kraken Rum with winners called from the stage and presented with their tickets. Raffle details will be announced upon arrival at the venue on May 26th. Bloodstock official sponsors EMP will be present to offer a plethora of promo material to add a bit of fun to the night. For more information on EMP, simply click here. Tickets for Bloodstock Festival are on sale NOW! To get your hands on some, simply click the graphic below and place your order for the most metal weekend of the year! DO IT!